Content: S. Lem "Doskonała próżnia" (Czytelnik - Warszawa). Marcel Coscat "Les Robinsonades" (Ed. du Seuil - Paris). Patric Hannahan "Gigamesh" (Transworld Publishers - London). Simon Merill "Sexplosion" (Walker and Company - New York). Alfred Zellermann "Gruppenführer Louis XVI" (Surkampf Verlag). Solange Marriot "Rien du tout, ou la conséquence" (Ed. du Midi). Joachim Fersengeld "Perycalypsis" (Edition de minuit - Paris). Gian Carlo Spallanzani "Idiota" (Mondadori Editore). "Do yourself a book". Kuno Mlatje "Odys z Itaki". Raymond Seurat "Toi" (Ed. Denoel). Alistar Waynewright "Being Inc." (American Library). Wilhelm Klopper "Die kultur als Fehler" (Universitas Verlag). Cezar Kouska "De impossibilitate Vitae"; "De impossibilitate prognoscendi" (2 tomy), (Praha, Statni Nakladatalstvi N. Lit.). Arthur Dobb "Non serviam" (Pergamon Press). Alfred Testa "Nowa kosmogonia" . 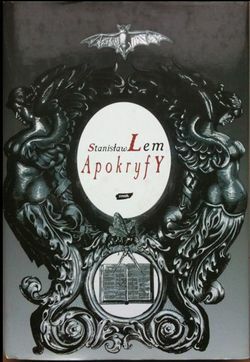 Wielkość urojona: Stanisław Lem Wstęp.Cezary Strzybisz "Nekrobie"(139 reprodukcji) - wstęp. Reginald Gulliver "Eruntyka" - wstęp. Juan Rambellais "Historia literatury bitycznej" - wstęp i wstęp do II wydania Ekstelopedia Vestranda w 44 magnetomach - Profertynka. Vestranda Ekstelopedia - (arkusz próbny). Prowokacja. Horst Aspericus: Der Völkermord. I. Die Endlösung als Erlösung. II. Fremdkörper Tod. (Getynga 1980). J. Johnson and S. Johnson: One Human Minute, (Moon Publishers, London - Mare Imbrium - New York 1985). Biblioteka XXI wieku. Das kreative Vernichtungsprinzip. The world as holocaust - wstęp. Weapon systems of the twenty first century or the upside-down evolution. Posłowie Jerzego Jarzębskiego pt. "Z widmowej biblioteki"
This page was last edited on 25 August 2016, at 14:32.